Welcome to the dinner in celebration of the Chinese New Year. Traditionally, the Chinese New Year Eve is reserved for family reunion dinner. This is the most important dinner for the Chinese. Tonight, we may be a few days late for our own “New Year Eve dinner”, but as the Chinese people often say, “The festival is not over until the end of the first month of the new year.” Therefore, we are not late yet for our most important dinner of the year. And, may I say it is a real delight to have you all with us. 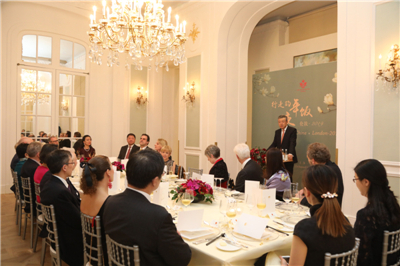 All of you are old friends and strong supporters of China-UK cultural exchanges. I would like to take this opportunity to extend my heartfelt thanks to you for your contribution to better understanding and closer friendship between the people of our two countries. 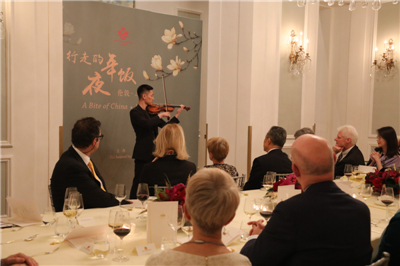 My thanks also go to Hotel Mandarin Oriental Hyde Park for allowing us to spend a beautiful night at the time-honoured Loggia. 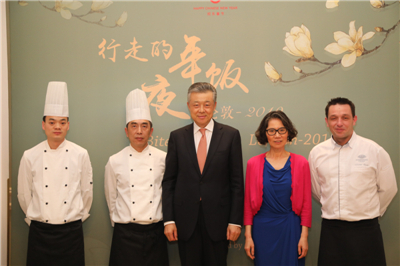 Our New Year Eve dinner is a joint masterpiece of the chefs from the Chinese Embassy and Hotel Mandarin Oriental Hyde Park. We are also privileged to have the company of two musicians, who will be bringing a feast for the ears. I hate to stand between my honorable friends and what promises to be an exceptional enjoyment for the taste buds and ears created by the fusion of Eastern and Western food and music. But, there are still a few more words that I want to say. Food is an important part of culture. It can connect people’s hearts. It has the special charm to play a unique role in cultural and people-to-people exchanges between states. First, food captures the beauty of life. Even a sage who is contented with a simple life would suggest that one should prepare the ingredients most elaborately in order to cook the best meal. After thousands of years, food, cuisine and table manners have integrated with Chinese philosophy and etiquette to form the unique Chinese food culture. Second, food reflects the beauty of harmony. One of my British friends quipped about “British food” being the shortest joke in the world. But this is not necessarily so. In fact, here in London, one can enjoy best food from across the world. This is part of the cultural diversity in Britain, and harmony arises from this diversity and ability to appreciate different cultures for their unique beauty. This year marks the 70th anniversary of the founding of the People’s Republic of China. Our greatest achievement in the past 70 years is that we have ensured that one sixth of the world’s populations have adequate food and clothing, and enjoy the beauty of life. Third, food embodies the beauty of compassion and friendship. Delicious food not only meets the basic need, but also builds bond between people. What is special about the “New Year Eve dinner” is that we dine with people whom we hold dear. And drink three hundred cups of wine in ecstasy. Chinese food has always been a link between people all over the world who love Chinese culture. Wherever in the world, wherever there are Chinese people, there are always Chinese restaurants. Wherever there are Chinese restaurants, fans of Chinese culture would gather. Chinese food helps open a window for them to learn about Chinese culture. Enjoying Chinese food together helps them make friends with the Chinese people. As we ring out the old year and ring in the new, let’s take this opportunity to bid farewell to Minister Zhu Qin and Minister Counsellor Xiang Xiaowei, and welcome Minister Chen Wen and Minister Counsellor Yu Peng. 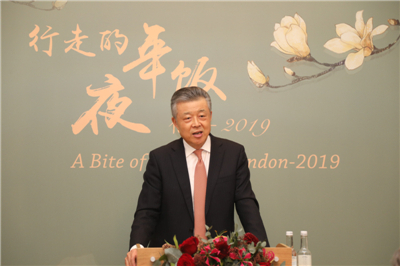 Over the past few years, Minister Zhu and Minister Counsellor Xiang have worked hard and contributed to advancing China-UK relations, including cultural and people-to-people exchanges. They have made many friends and built strong friendship with you. But, as people say, “All good things come to an end.” As they end their term in Britain and take up new responsibilities, let’s wish them every success in the days to come. Minister Chen and Minister Counsellor Yu are both senior diplomats who know the UK very well. I have no doubt that they will live up to their new responsibilities. And I am sure they will have your warm and strong support in their work. In conclusion, I wish you and your family a happy and prosperous Year of the Pig!